I swam laps this week at the Y and in the lane next to me was a high school kid. In talking I learned that he is on a competitive swim team and his favorite stroke is the butterfly. While I feel like I get stronger and a little better each time I swim, I couldn't help notice that he would finish two laps to my one. At the end of my workout he was at the end of his lane, waiting to race the clock again. I told him "Good swim." He looked up and replied, "You too." I thought about that comment on my way back to the locker room. It was a good swim, even if he could have swam laps around me. The pool hadn't been crowded, I'd had my own lane, and I had swam one of my best times yet. It reminded me of middle school track and a lesson I needed to take from my younger self. I was often assigned the mile and the 800 for our races. Make no mistake, this isn't because I was speedy. My son, Luke, just finished up his middle school career in track. His fastest mile was right around five minutes. Mine would have been closer to eight minutes. I was assigned the races because no one else wanted to run distance. While I wasn't fast, I was an excellent pacer, still am. So, I'd head out and run. I knew I wouldn't win, but that didn't bother me. I liked being on the team. I'd focus on my own race and not worry about the people speeding past. I think this is true in teaching too. Sometimes when I am online, or at school, I see what others are teaching and begin to look at myself. Am I doing enough? I work so hard, but maybe I'm not keeping up? It is enough to create some strong self doubt. Lately, I've been writing more. I'm looking at the topic I've been presenting on for Scholastic - the impact of audience in our classrooms. It's important and it is something I think about a lot, but then that voice comes in. Who am I to write about what I'm doing? It's at this point that I think I need to take a breath, look inward, see that what I'm doing does matter, and just concentrate on my own lane. Not that I can't speed up and beat someone to the finish line if I so choose, but when I'm looking left and right, you can begin to feel like you aren't enough, what you are doing isn't enough. Not cool and, more importantly, not healthy. Teaching often reminds me of being a mom. I never feel caught up, I never feel like I've accomplished everything I want to do. And yet, we can only do so much. Like parenting, there are tremendous rewards, but it is also an exhausting profession. In it, and back in the pool, I'm going to try to channel my middle school self and just enjoy being there and doing my best. Everything else can simply fall into place. I wish I could remember how I got the ARC, I feel like it was from a friend, John Schumacher, but it has been years so I'm not sure. What I do know is that on February 8th of 2012 I closed the cover of a book that would change me. 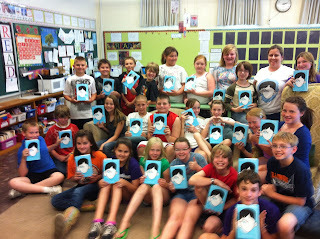 Wonder by RJ Palacio was a breath of fresh air. Auggie Pullman swept in and stole my heart. I immediately began to brainstorm, how could I get this book for all of my students? I moved quickly and by the following month, I had a book for every kid in my homeroom. We read it together as the year came to a close. When the year ended, and the day of the yearbook signing came, my students were the ones walking around and getting their copies of Wonder signed. I was in love. That November NCTE was in Las Vegas. This was not a city for me. I love the conference, seeing friends, talking about teaching, finding books. But the lights, the crowds, it was overwhelming. I clearly remember standing in a hotel room that had a pool table, looking over the city, at the first, and soon to be annual, Nerdy Book Club gathering at NCTE. While I stood there, feeling a bit out of my element, a woman came and stood next to me. We began talking about families, the city, and I introduced myself. When she said her name was Raquel, otherwise known as RJ... tears jumped into my eyes. I wanted to gush, tell her all the book had meant to me in just a few short months, but I held back. Instead, we had a quiet conversation that I will remember for some time. One mom talking to another in a city that, I'm guessing, was overwhelming to us both. 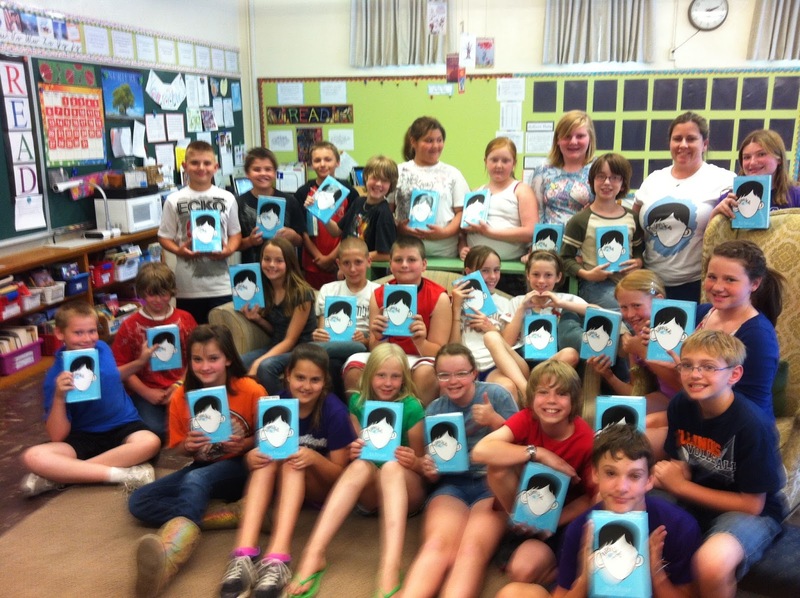 Over the next few years I read Wonder aloud to some classes, and recommended it to more kids than I can count. As school wrapped up this year, my first in middle school, I saw the trailer for the movie. (Trailer HERE) The feeling of reading the book for the first time came flooding back. And, even though we had just wrapped up the school year only hours before, I began messaging my colleagues. Should we do an all school read around Wonder? I posted this blog post asking for ideas. Then I got a text from my former principal in our 4th/5th building (and in my district) - they were doing Wonder as a read aloud. The librarian from PreK-3rd contacted me, she wanted to do a school wide read too and wondered if we should join together. And it mushroomed. In the last few weeks a team of teachers and librarians from my district have gathered, trying to figure out how to fund this idea. No longer are we looking at one school, or two, or three. We are attempting a community read - all the schools in our district and our entire community. We want to bring our tiny town of over 5,000 people together around the books Wonder and We're All Wonders. We've just begin fundraising for the books to get them into our school. We're also going to be asking local businesses to join us, to have copies in their place of work for community members to stop in and borrow - read & return, or pass on. We're planning a Facebook page for community members to share their thoughts as they read, along with our students. We're going to also have a Twitter hashtag. The publisher is helping us with a discount for the books since we're giving them away. This was my summer of saying no. Time to be home, be lazy, read, relax, hang out with my boys. But once this idea popped in my head, I couldn't say no. A whole community that knows Auggie? 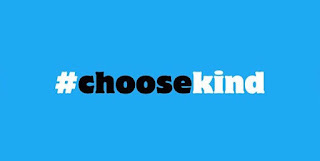 A community where parents, children, everyone knows what it means when someone says choose kind. A community that knows that everyone deserves a standing ovation? So, if you have done anything like this before, shoot any advice my way. We're hoping to be done fundraising by the end of July so we can order the books in August. Books will be distributed towards the end of September so we can read the book in October for National Bullying Prevention month. And then, in November, some grades will be heading over to see the movie. We're a tiny town in the middle of Central Illinois. I always say we're just a little hamlet, surrounded by cornfields. Draw a line between Chicago and St. Louis, and you'd find us halfway. There are two traffic lights in our town. The only skyscrapers we have are grain elevators and a water tower. We are small, but mighty. I love this town, my hometown. It is filled with good people. And when they get ahold of this book, when they begin these conversations, I cannot wait to see what unfolds. It will be magical. I cannot wait to be part of it. Today is my oldest son's birthday. As I was thinking of everything I love about him, one quality that came to mind was his loyalty to his friends. That made me sit and marvel at the friends both of my boys have made. They are interesting kids. Kind. Nerdy about the things that they love. Each group is quirky in their own ways, but kids I like to have around. I know I have preached to my boys since they were small that who you surround yourself with matters. They will influence you, you will influence them. They have chosen wisely. My parents gave me that advice when I was young. I listened, sometimes, but knew it to be true. When I became a teacher, many moons ago, my mom (also a teacher) repeated it. My cooperating supervisor did as well. I clearly remember her telling me that there would be teachers who would never have anything positive to say about education, administration, fellow teachers, and/or students. But there would also be so many teachers who you could bounce ideas off of, turn to for advice, a shoulder to cry on, and laughter between classes. I'm glad to say that I've found so many of those teachers over the years. What I could have never counted on, back in the late nineties when I began, was finding so many educators to connect with online. That some of my closest educator friends would teach hours away from me was unheard of, yet that's where I am. 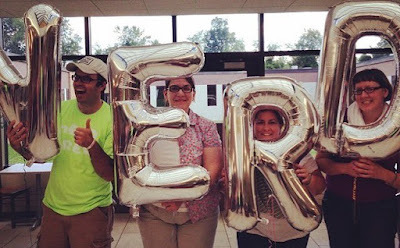 Many are gathered today in a small town in Michigan where another NerdCamp is ready to begin. There over 1500 teachers have traveled to talk about kids, reading, story, and making our classrooms a better place. Those are my kind of people. So whether it's your third year in education, or your thirtieth, I hope you've found some people to surround yourself with. As I prepare to begin my twenty-second year, I can picture mine. My local colleagues who I text to vent about politics. The ones who come in my room, lay on my couch, and quickly catch up when we have a moment. The one who brings me lunch, even though we're in different buildings now, so we can catch up once a month. The ones who make me laugh so hard in the halls between classes that I have to lean over and catch my breath while tears stream down my face. Just as important are those that live hours away, but send me Voxer messages daily. I catch up with while walking Rosie, and then Leia, each morning. Two miles per day where I hear what they are doing in their classrooms, what they're reading, and they push my thinking. Because of all of these educators, I am a better teacher. It is said that teaching is often an isolating profession. We are surrounded each day by people, for certain, but they are a bit younger than we are. I have found that it can be isolating, true, but we can also find so many opportunities for connections within our own buildings and in the wider world if we look for them. What a fabulous experience that can be. Last summer I was on vacation in my favorite spot, Daufuskie Island. Prior to our trip, I had been trying to run 2-3 times a week. Both of my boys were going to try a new sport that fall, Cross Country. In solidarity, I laced up my shoes. It wasn't pretty. I'm not in great shape. I walk daily, but running was a struggle. Yet, I continued plodding down our street and trying to improve. Ugh. Then, we went on vacation. The heat and humidity were enough to make me throw in the towel. Yet, I knew I needed to do something, anything. At forty-two (then), I knew fitness was important. I was beginning to wonder, however, if running was not the path for me. On day two on the island I biked past the lap pool. I paused. I love the water. I loved swimming as a kid. Every summer I usually find myself at a pool and swim a few laps. Maybe that would be the ticket? I went back to the house and grabbed my goggles. That first day I swam maybe ten laps (twenty lengths). It was slow going. The next day I decided to try 20 laps (40 lengths) because that would be 1000 yards. I did it, with many breaks, in about 50 minutes or so. The rest of the week, I continued to trek to the pool each day and squeeze in a swim. I found I was actually looking forward to it. Returning from vacation I swam at my local pool in the mornings before they opened for swim lessons, two to three times a week. When the school year began, I turned to the YMCA, about twenty miles away. First after school, then waking up at 5am, I found myself continuing my swimming practice. There were two times during the year that I was interrupted from my weekly ritual for illness, but I persevered. This summer I've continued to swim, three to four times most weeks. My longest swim to date was 2000 yards (40 laps, 80 lengths). The time was 56 minutes, not too far from my first swims that were half that distance in a similar time. My sons both enjoy running. My oldest has gone to state now twice in track, once in Cross Country. I used to love to run, but like all things in life, that has changed. What I love about swimming is what I enjoyed about running. The solitude. The feeling of competing against myself. The time to find my center. This week I grew frustrated. This has probably been my best summer for fitness since I was a teen. Two mile walks each day with my dogs, swimming over two miles a week, and I've recently added PiYo DVDs to the mix, yet the scale doesn't budge. If anything, it has jumped a bit in the wrong direction. I exhaled. Loudly. Then I pulled myself together. My clothes are looser. My anxiety is much more manageable. I feel stronger, happier. Swimming has brought me back to the person I was when I was young. The preteen who loved counting the strokes to breathe, letting the laps add up as I plowed through. Maybe the numbers don't matter as much as the pure enjoyment of knowing I'm doing what is best for me. And that's a lesson I think I need to take into the fall. My seventh graders came to me last year, some as kids who had been identified as readers that struggle for years. The defeat is easy to read in their body language, or outright in their writing, if you look for it. I tried hard not to focus on the numbers, but focus on the child. When I jumped in that pool last summer, I would have quit if someone said I needed to swim 1000 yards in 27 minutes. I just enjoyed the journey. Now, that's easy and I'm looking to improve. What can I do to meet my students where they are? To make their journey as readers and writers in seventh grade one they look forward to, one they want to jump in and try, even if it's tough? It's something I am always thinking about. The only sure way to grow as readers and writers is to be actually doing that work, just as I had to put in the work in the pool. 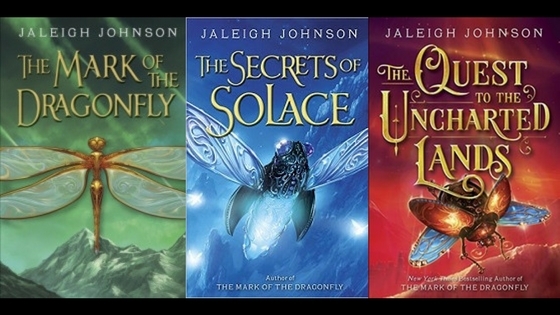 So how to get kids to want to read and write? Choice in their books and writing topics helps. So does access to books, strong relationships, a supportive classroom community, lessons that engage. And, like I did this week, I think addressing frustrations head on and not letting the "data" get you down is key, but continuing to push forward. I'm excited to meet this new batch of kids next month and dive in to our year together. I think we're going to have a great one. I've been doing a lot of thinking around audience this summer, it was the topic of my presentation at the Scholastic Summit and I've been writing around a few ideas. 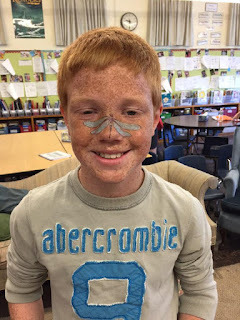 For the past few years I've made it a mission to give my readers and writers an audience through our classroom. The size of the audience can vary. Sometimes they choose to share with a friend, sometimes with the class, sometimes with the school, sometimes with our town, and sometimes with the world. Our method of sharing can vary from a peer conference, to a book talk, to Padlet, to Flipgrid, to Twitter, to... you get the idea. But one tenet has always been important to me, that my students get to make that choice for themselves. See, I was a shy student. My mom attended parent-teacher conferences through my senior year not because I was doing poorly, not because the teachers requested them, but because she was convinced without attending them, they might not see me. I was that quiet. However, in my own way I did make noise. I tried to do right when I could, speak up when I could. That belief has followed me until today, do what you can, when you can, in any way you can. My friends know that it was out of character for me to begin blogging, to begin presenting at conferences. That is not me. However, I took tiny steps forward and the reception was kind, the water was warm. People encouraged me, cheered me on. Comments here, on Twitter, and on Facebook, made me want to try harder, to do more, to speak up - even though it scared me. That is what I want for my students too. To try to speak up. To share their heart. I can tell them it's scary. I can tell them that it was hard for me too. But I will be with them every step of the way, and so will our classroom community. Will we mess up, of course. But when we do, we will talk about it. We will come together, brainstorm what we could have done, and support each other in growth. We don't want to silence voices, but lift those up. There is far too much silencing and negativity online. That is not what I want for my students, or for myself. And we will begin in the way I always do, with this quote from Theodore Roosevelt. I look at it all the time. It reminds me that it isn't the critic whose voice I need to be listening to, the person who wants to spew only negativity isn't helping me grow. Instead, I look ahead, aim high, and keep moving forward. I hope my students can join me down this path, we have so much to share.